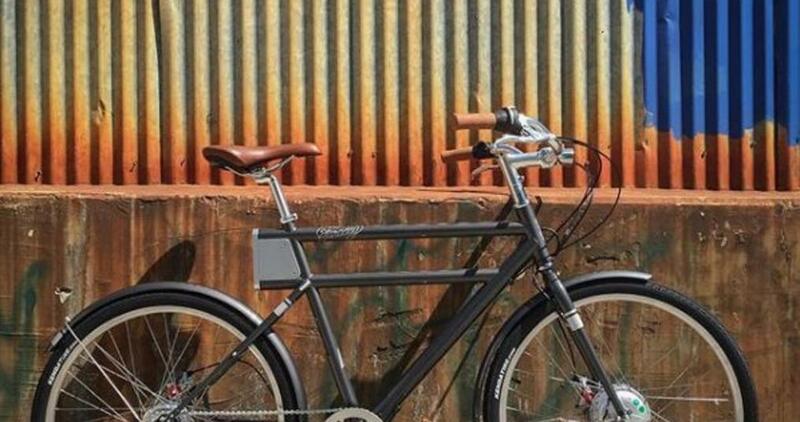 We now have 2 models and 3 sizes of Faraday's fantastic Porteur line of electric bikes. We've sold cargo bikes with electric assist for 8 years now, and used them for over a dozen. Moving car-size loads without cars, especially in hills, is the best rationale ever for having an electric helper motor on your bike. But what about motors for regular bikes that carry only their riders and a little more, like groceries and a laptop? We've been pretty cool on the idea, for reasons we won't digress to explain. We've now come around to embrace electric assist even for non-cargo applications, and Faraday's Porteur is largely responsible. In the broad and diverse field of electric bikes, these are as far as possible from scooters with vestigial pedals. They are attractive, visually and physically much lighter than most other electric bikes. The chromoly steel tubing is notably thin walled, giving a lively, smooth ride. It takes more skill and care to build a light supple steel frame than a clunker, but you can't tell by looking. It's a care you feel upon riding. These are nice bikes even without assist, well balanced and comfortable. Then there's the assist itself. It's meant to be stealthy, superlatively well integrated, with battery concealed in frame and front hub motor not too big: no electro-clutter. There's no throttle: you just pedal, with a selector switch for full power, half, and none. The motor is very quiet, with internal nylon reduction gearing. The stealth ends with the ease you'll be humming along at 20 mph while sitting nearly bolt upright. A charge lasts 20-25mi according to most users, and then it's not too hard to pedal without help. There are 2 models separated by $700. The fancier one comes with an 8-speed internal rear hub, belt drive, and bamboo fenders at $3500. The S model at $2800 has a 5-speed internal hub, chain drive, and metal fenders. Aesthetics aside, the metal fenders work better than the bamboo, there's nothing wrong with chains after you slap a guard on, and 5 speeds are likely enough when you have a motor helping. Please come try one. We've got a medium-sized one in our rental fleet, even!